… it’s almost Shabbas. It is the second Shabbas since the post-Shavuous #HoustonFlood – a deluge of almost biblical proportions that was not related to a hurricane. The house has been, for all intents and purposes, gutted. Mom is officially one of the displaced and living in a hotel. We spend our days in clean up and salvage mode. 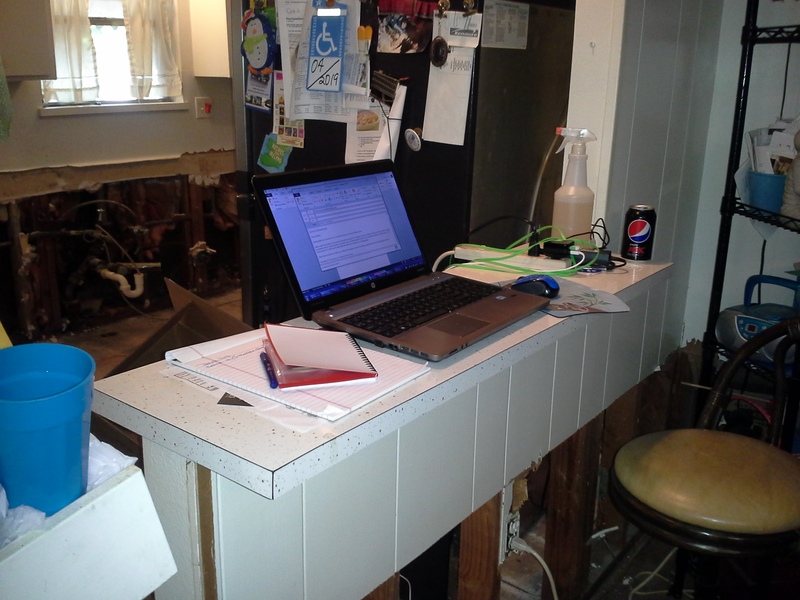 I’m writing this while standing at what used to be the bar in what used to be my Mom’s kitchen. This space has become my satellite office. Mom’s a trooper. She covered all the emergency, immediate needs before I arrived in Houston. On Flood Day 2015, she found a damage restoration contractor that was at her house as soon as the streets cleared. We were both ecstatic. Then she tells me that they’re Israelis – BONUS POINTS! Mom had her own mini-#IDF coming to her rescue. The team from Speed Dry USA has been amazing! They’ve treated Mom like mishpocha (family). Their concern was as much for her well-being as it was for damage control. Gigli arrived with his team to rip out carpet, pull up floors, and tear out drywall. They emptied closets and cabinets and moved Mema & Grampa’s furniture out of damp’s way. In the meantime, I made calls and registered Mom with every possible agency. I reached out to dear friends to check in on Mom – remember I was in Atlanta when the waters rose. Suzi Merritt, Kathi Kowalski Sandler, and Ricky Guinea stopped in daily to make sure she was okay. Kathi, invited me to the ‘Houston Flood 2015 Resource/Support Group’ on Facebook. People posted stupid-proof information about receiving every possible form of assistance. Then there were the posts about very specific needs – neighbors responded. Those with, offered up what they had. Others coordinated volunteers to bring water, food, trash bags & cleaning supplies. Businesses offered free services. I posted. Total strangers and friends from long ago responded – Mom was going to be covered until I was feet on the ground in Houston. Then I got here. It was overwhelming. My paralegal brain kicked in and knew what to do, but I couldn’t just bulldoze over Mom. It’s been, to say the least, a very difficult week. I’d share my feelings, but Arlene Nisson Lassin has captured the essence so well – Back to the Anger Phase of Flood Grief. Like my I-hope-to-meet-one-day-friend Arlene, the emotions come in waves . . . and at the oddest times. It usually hits when I read Facebook posts about how our community has mobilized to provide, well, everything. My dearest friends and my newest friends from the FB group have provided everything from water and food to supplies and physical labor. Given, freely, from the heart. It’s going to take a long time to get back to normal, but we’re going to get there – not just Mom, but the entire community. One day at a time, one Shabbas at a time. Tonight, we will bring in Shabbas with Mom’s mini-#IDF team. We’re looking forward to a home cooked meal and the company of new friends. Tomorrow we’ll daven at Beth Yeshurun with more members of our community. It’s going to be nice to see and meet our friends. Tonight, when you light your Shabbas candles, I ask that you include a prayer for the Houston community – for a refuah shleimah – a swift and full recovery. May you each enjoy a peaceful and restful Shabbat.